If you want your newly poured concrete driveway to look great and last for decades to come, proper maintenance and care are crucial. You can maintain and keep your driveway in great shape by keeping 9 important details in mind. One of the most common causes of cracking in new driveways is the lack of “curing.” As a rule of thumb, you should avoid using your driveway for the first seven days after it has been installed. Furthermore, hold off on any heavy equipment installations on, near, or around your driveway until 15-30 days have passed. After about a month, a new driveway will be fully hardened and ready for normal usage. During the first 30 days following the installation of your driveway, keep heavy trucks and/or construction equipment away from it. Particularly, loaders and skidsteers can also cause tire tracking on concrete that hasn’t fully settled yet. As time wears on, concrete driveways are subject to harmful chemicals and natural wear and tear. You can protect the integrity of your driveway by having it sealed every 3-5 years. If you neglect the driveway and forego sealing it for several consecutive years, it could gradually become victim to deterioration and spalling. Generally, oil does not pose a problem for concrete unless it is left un-cleaned. In this case, it is more of an unsightly defect than anything. However, it does not pose a threat to the structural integrity of the driveway in any way. Oil is incredibly prone to staining concrete, so it’s a good idea to clean it as soon as possible using a brush with heavy bristles, degreaser, and water. As time goes on, you might notice areas in the driveway that collect water after it rains. These areas, fortunately, aren’t normally a big problem. You can determine whether or not you should worry about a low spot by waiting for a period of rain to pass. Once the rain has stopped, bring a quarter to the low spot and drop it into the collected water. If the quarter is still exposed above the water, then there’s no real reason to worry about the low spot. However, if the quarter is visibly underwater and the low spot spans more than 2-3 feet across, you should take action. 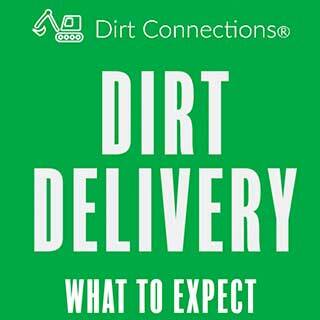 Dirt Connections can help prevent any future problems that can arise from low spots. While these types of products are extremely handy, they should never, under any circumstances, be used on your driveway. This is especially true for patterned or stamped concrete driveways. Any vehicle that is equipped with chained tires should be used carefully on the driveway. If the tires become stuck and begin to spin on the driveway, the concrete could suffer significant damage. After this type of damage is sustained, there normally isn’t much that can be done to repair it. Dirt Connections has seen driveway damage from moving vans more times than we’d like to remember. As a rule of thumb, just keep these types of vehicles on the roadside and away from the driveway. Your trash collector should never have any reason to drive their vehicles onto your driveway. The weight of most trash trucks can be enough to damage parking lots with 6 inches of concrete. By all means, speak with your trash collectors if you feel that they might try to drive their equipment on your driveway. Our organization is comprised of trained, experienced individuals who take pride in their work. We are always excited to help our clients with their projects, as well as the maintenance of those projects going forward. We have many different decorative options that can satisfy your project ideas, and we’re well-equipped to meet virtually any demands. 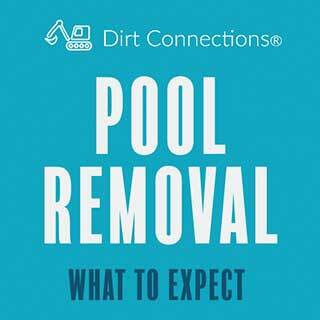 Are you ready to see how we can take your concrete paving project to the next level? 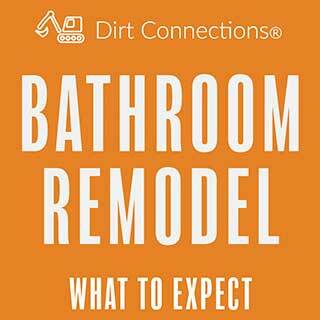 Contact us today, and we’ll help make your remodeling dream a reality.